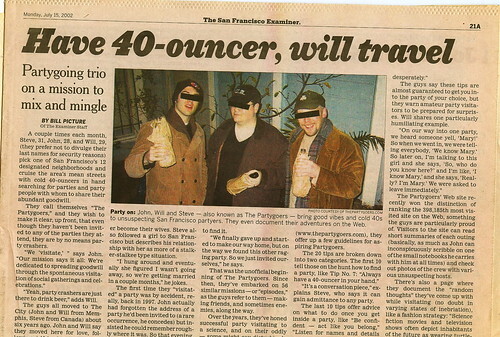 Sadly, this image is the only known evidence of the Goers’ interview with the San Francisco Examiner’s Bill Picture in the summer of 2002. Collectors have made it known that a mint condition copy of the entire article, should it exist, would fetch in the high seven figures. Since you’ll undoubtedly want to zoom in and enjoy the witty gems served up as the Partygoers tell their tales, click here or on the image below to enlarge.